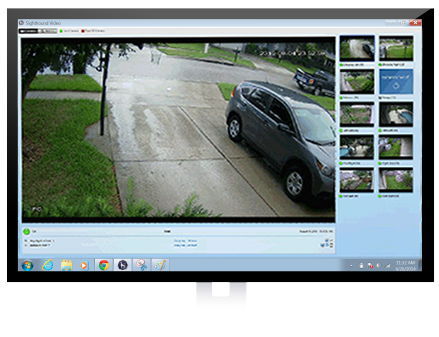 Powerful computer vision technology that brings intelligence to your surveillance system. People Detection. Not just motion detection. Sighthound Video has been trained to recognize people and objects in the same way that a human brain works. Receive a mobile alert or email when people are detected, not when animals or cars pass by. Sighthound Video is available as a software download that can be installed on your Mac or Windows PC. It's also included with the small, quiet, and astoundingly robust Intel NUC in the Digital Security & Surveillance (DSS) Appliance, and in the Intel DSS Bundle with two IP cameras. * You will be redirected to an Intel Technology Partner for purchase and fulfillment. Computer vision in the software determines what’s happening so you don’t get hundreds of false alerts. iPhone and Android apps to monitor a live view of your home, show you clips of events, and provide you with alerts. Match your video clips to any resolution your camera supports. Sighthound supports almost every brand of IP camera and webcam out there. Don’t get locked into one brand. Draw boxes around doorways to capture people entering a room, create thresholds on driveways to trigger people who cross, and mask areas of the scene to ignore. Have upstairs cameras go off at night, yard cameras off on weekends and delay recording until you’ve left the house. Avoid cloud storage fees. Automatically upload only clips you care about to the free storage available at Google Drive, Dropbox or your preferred cloud service. Multi-Cam + HD support, remote access, and more!